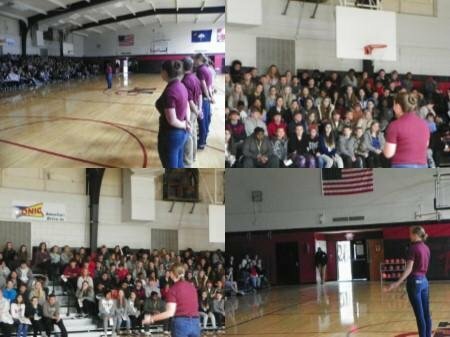 On January 10, 2019, the Mid-Carolina High School JROTC Battalion went to the Mid-Carolina Middle School to talk to the eighth grade students about JROTC. MAJ Taylor and SFC Foster both spoke and gave an overview of the program and the benefits of joining. The following cadets Emily Wessinger, Melina Cardenas, Georgia Durden, Remington Cox, Sarah Smith, Brittany Moore, and Tyler Shackelford informed the students of the different teams within the program and answered questions. The students were also given a JROTC information pamphlet to share with their parents.